Team India not only won the ODI match between India and Sri Lanka but also gave a chance to Indian cricketer Shardul Thakur to play in the fourth match between the countries. But the cricketer's debut will be remembered all through his life for this one wrong reason. Not only did Shardul became the 218th player to represent our country in the ODI, but also attracted the audiences when he wore the jersey no. 10 which legendary player Sachin Tendulkar had earlier worn in his matches. The official account of BCCI shared the moment when Shardul received the ODI cap by coach Ravi Shastri. The tweet read, "Proud moment for young @imShard as he receives his ODI cap from @RaviShastriOfc." 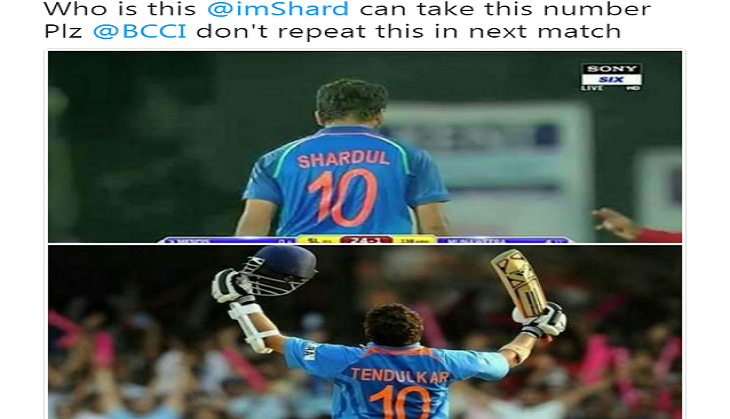 Hey @BCCI I thought Jersey No.10 retired with Sir Sachin Tendulkar. How come Mr. Shardul Thakur is wearing this number? NOT COOL AT ALL. Virat Kohli and Rohit Sharma scored centuries and India scored a total of 375 and won the match by a huge margin of 168 runs making it 4-0 in the ODI series.